Music evokes memories, plays on our heartstrings, moves and delights our senses and sets a unifying tone for ceremonies. Sometimes couples have clear ideas about the music they wish to include and that gives me a feel for the mood we are creating together. Other times, ideas for music (like other elements and rituals) are inspired by the couple’s story and the themes that emerge. Here’s a musical look back at some of the love songs that accompanied my wedding couples in 2012. Each couple’s ceremony is unique and reflective of the special qualities and spirit of their relationship. Sometimes that includes a desire for a very traditional element such as walking down the aisle to Wagner’s classic Wedding March (the quintessential, “here comes the bride”) as Liliana chose to do. In contrast, the very contemporary and wondrous Afternoon Love In by Prefuse 73 played a special part in Sarah and Jonathan’s love story. It was fun to decipher the tune’s groovy structure and to choreograph the entrances of the wedding party around its varied rhythmic and melodic sections. When I learned that Haley really liked Jason Mraz’s lilting love song I’m Yours, I suggested Vitamin String Quartet’s rendition for the recessional. This instrumental version matched the elegance of their ceremony and because I’m Yours was such a popular song I’m sure many of the guests heard the sweet apropos lyrics in their heads or were quietly humming along as the couple joyfully recessed. When rain threatened a wedding in the Berkshires, the garden needed to be set-up with fewer chairs and the acoustic guitar had no amplification. These changes actually made for a more intimate feeling as the guests gathered arm in arm and drew nearer with the entrance of the wedding party to hear Purcell’s regal Trumpet Voluntary. For Kelly and Mark who first met in London, then lived for a time in Australia and got married on an island in Lake Winnipesaukee, I proposed a parade of the guests (a tradition found in various parts of the world) from the boat dock to the ceremonial site. 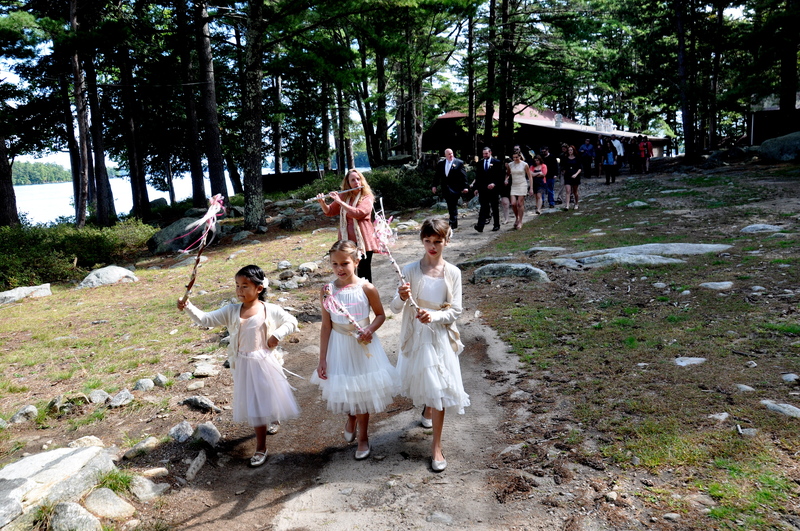 Three eager flower girls led the way while I played two tunes from the British Isles on flute: Haste to the Wedding & Marie’s Wedding. Another couple thought they’d have a simple elopement ceremony and forego music altogether. But after learning about the groom’s love of the cello I suggested Josefin’s Waltz by cellist Natalie Haas and fiddler Alasdair Frazier. 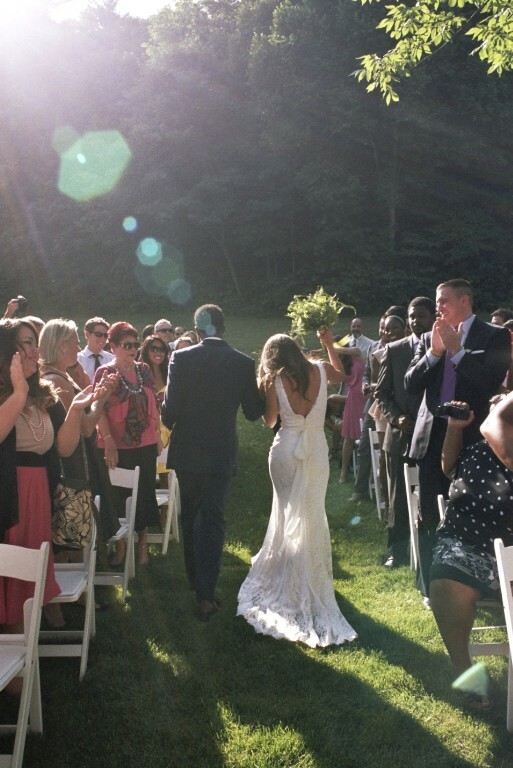 Accompanied by this beautiful duet, the groom and bride each walked a half circle and met one another before the large stone fireplace at their New England farm venue. What melodies will accompany my couples up and down the aisle in the coming year? I’m eager to hear. Whether recorded or performed live, the musical possibilities for processionals, recessionals and within the ceremony itself, are endless! Sarah and Jonathan dancing down the aisle to Louis Prima’s The Music Goes Round and Round.